Cary Flanagan, designer and author is our guest today on the QuiltWoman.com Blog. I am finally back to sewing and quilt design after many months devoted to fiction writing and planning two new books of quilt designs. 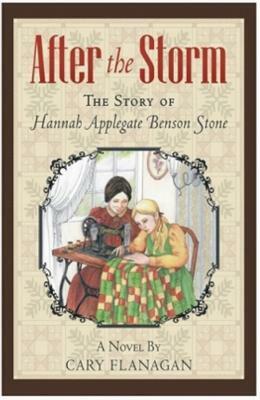 My first novel, “After the Storm” (quilt related, of course! ), was published last spring. It is a historical novel about a 19th century quilter named Hannah growing up in a small New Hampshire town. It is written as a (fictional) memoir. The story had such a good reception that I began, almost immediately, to work on a sequel that features the next generation of this creative and courageous family. But I have also been missing the design and hands-on sewing experience which has been my mainstay. And anyone who has tried to write AND design knows that each of these endeavors uses entirely different parts of the brain. I thought I could switch back and forth, but apparently not! At the end of January, I joined members of my quilt guild for our annual four-day quilting retreat. I got a lot accomplished on two projects that I had planned out in detail before I went. Just as I hoped, that intensive, total immersion into sewing with my friends, got me jump-started back into the whole process of designing two completely new projects and getting each of them well under way. I am confident that both of these designs will result in new patterns that are a departure from the patterns I have designed and marketed over the past 12 1/2 years. It certainly feels like it is time for a new direction!. I am excited to be working on something really new for me. I guess my next novel will have to wait a while! One thing I would love to encourage any of you who are either not part of a quilting guild or have never been part of a quilt retreat, PLEASE “run, don’t walk” to join either or both of these opportunities if you possibly can. You will learn SO much and make lots of new friends. If nothing like that is available where you live, either host a group of quilting friends yourself or join an online group. You will be glad you did. I have begun a monthly newsletter which will keep subscribers informed of new projects I am working on, quilting tips and suggestions, and surprise give-a-ways now and then. I send out a new issue at the beginning of every month. You never know what you may learn from me! P.S. I want to thank Nancy Dill of QuiltWoman.com for providing me with support and a marketplace for almost thirteen years!!! I would not be where I am today without her!